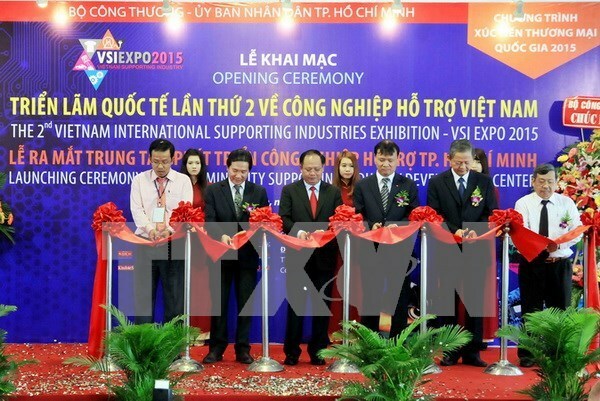 Over 140 foreign and domestic enterprises are showcasing their products at the second Vietnam International Supporting Industries Exhibition (VSI Expo) 2015, which opened on August 27 at the Tan Binh Exhibition and Conventional Centre in Ho Chi Minh City. On display at 220 booths are natural fibres, chemicals, electronic spare parts and mechanical components, among others. The four-day exhibition is part of the national promotion programme, said Nguyen Phuong Dong, Vice Director of the municipal Department of Industry and Trade, highlighting that participants will have a chance to popularise their latest products as well as become a supplier for Vietnamese projects. The event also encourages domestic businesses to invest in advanced technology to generate high-quality products while increasing competitive capacity to increase export and attract foreign investors. Speaking at the opening ceremony, Deputy Minister of Industry and Trade Do Thang Hai spoke highly of efforts made by departments, branches and enterprises to organise the exhibition, which helps speed up the development of national support industries.